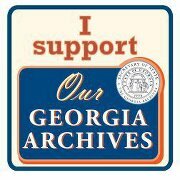 The battle to save the Georgia Archives isn’t over, as the 2013 Georgia legislative session continues without — as yet — a vote on funding for the Archives for the upcoming year. We’re now in the fourth week of the 12-week scheduled legislative session and time is starting to be a real issue to get enough funding restored to the budget for the Georgia Archives to keep it open and staffed and to get a good system in place to transfer the Archives — and funding for the Archives — from the Secretary of State (where it’s just a political football) to the University System of Georgia (where we can hope the academic community better appreciates this priceless resource). And that’s where things are stuck. First off, the proposed budget is barely adequate. The Governor says it will keep the Archives open two days a week; FOGAH and the Georgia Genealogical Society (GGS) folks aren’t so sure, and they and other groups fighting to save the Archives are working feverishly to get the budget amount increased, ideally by a little more than $1 million which would fund a five-day-a-week schedule. And the longer the legislative session drags on, and the more the legislators’ attention is focused on other issues, the greater the risk to the Archives for 2013. The simple fact is: there won’t be any money for the Archives without a vote by the Legislature to approve a budget. And there won’t be any improvement in the access to the Archives without the Legislature providing more money than the Governor has proposed. And there won’t be a smooth transition from the Secretary of State to the University System without additional legislative action. In other words, saving the Georgia Archives isn’t a done deal, and all of us who care about records access can’t let down our efforts. You can find a list of members of the Senate Appropriations Committee and its subcommittees here and of the members of the House Appropriations Committee and its subcommittees here. Every legislator’s name is a hotlink to an individual page with contact details. If you live in the district of one of these people, your voice needs to be heard now. If you don’t live in Georgia, why not check and see if one of these folks represents the area where your ancestors came from? That’s the kind of personal touch that might make a real difference in how that legislator viewed your letter. And even if you can’t find that kind of a connection, sheer numbers of letters and emails in support of the Archives can help tip the balance. If you’re not sure what to say, there are talking points on the FOGAH website with slides you can review under the “Help Contact Senators and Representatives” area. So come on, folks. It’s up to us. Every single one of us who cares about records access — especially but not just those of us with Georgia ancestors — needs to get into this fight. It doesn’t take a lot of effort. Join the Friends of Georgia Archives & History. Stay on top of developments at GeorgiaArchivesMatters. Take an hour to understand the issues and write to these Georgia legislators who hold the power of the purse in their hands. Come join me. Working together, we can make a difference. We can help preserve and protect our own history by helping to preserve and protect the Georgia Archives. Best of Luck to you. Gov Synder of Michigan almost closed The Archives of Michigan and The Library of Michigan but public pressure kept them open although with reduced hours. That’s a good example of how people working together can accomplish good things! So concerning! Add the Georgia lockdown, to tragic fires, unfortunate floods, disappearances, temporary unavailability, storage space limits, document shredding after an index is created, fading ink, mice and rat munching, etc. How lucky when anything valuable is discovered! And don’t forget an occasional war or two in these as well!! Yes, it really does amaze me sometimes that anything has survived… but boy would it be nice to have decent access to whatever has made it this far!